Far from the chaotic city life, the real India lives in its villages. Enjoy the best moments of your life at some of the exciting rural places in India. What’s better than breathing pure air, smelling the aroma of wet soil and savoring fresh food? Add to it, the amazing experience of staying in mud houses and watching the women of the house baking soft rotis on traditional ‘chullah’ to feed you. Gathering at the T-point to discuss important happenings of the day increases the fun quotient. At least for once, just forget about your mobile phones, leave behind your worries and spend some time only with yourself. Choose any of the rural travel destinations in India and get pampered with the world-class hospitality, warm welcome and cheerful smiles. Plan a trip and see how even the smallest of the things can bring happiness for many! How about walking on the 1000 years old Living root bridge? Mawlynnong, the emerging name in the village tourism in India, is famed for these bridges and its commitment towards Mother Nature. The surreal beauty of this village will render you in a state of awe. Flaunting the title of ‘God’s own Garden’, the village is a mystic heaven. 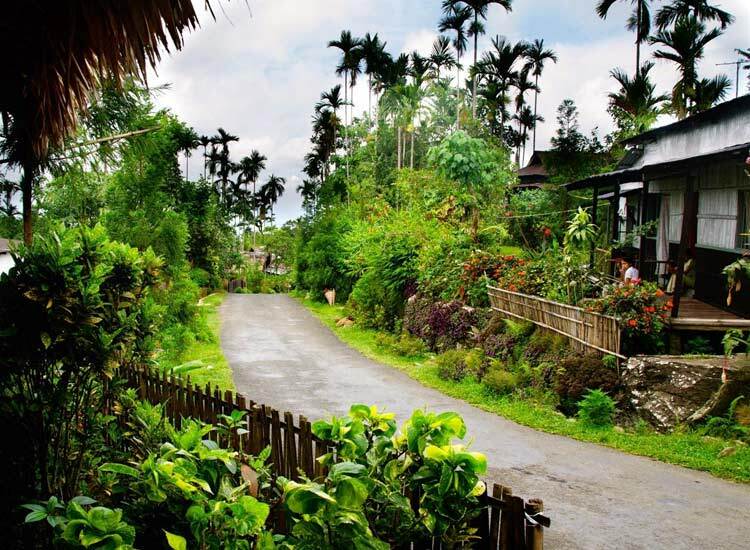 Best time to visit - Mawlynnong can be visited throughout the year. Known for wild animals and scenic landscapes, Bishnoi villages present rich Indian culture at its best. The natives of the villages are straightforward people leading a simple yet fascinating life. They are nature and animal lovers and welcome any guest with warm hospitality. Their love for nature is apparent from the fact that many Bishnoi people sacrificed their lives in order to prevent trees from cutting. Excited to meet such kind-hearted people? Best time to visit - October to March is the best time to visit Bishnoi villages. Out of a number of Brokpa villages, only two villages, namely, Dha and Hanu are open to the public. Bask in the warmth of the villages which you won’t get anywhere else in the Leh. Another striking feature of these villages is their people who are bestowed with a fair complexion, blue-colored eyes and an Indo-Aryan look. The unique dressing style also makes the villages of Dha and Hanu to rank amongst the best rural travel destinations in India. Best time to visit The best time to visit Dha and Hanu is between June and October. Beautifully tucked amidst the Kumaon Hills, Munsiyari is bounded by dense forests and snowcapped mountains. River Goriganga adorns the beautiful hamlet and makes it a must-visit place for adventure enthusiasts and nature lovers. Jaw-dropping background of the Panchachuli accounts for the popularity of this wonderland as a best rural place to visit in India. Best time to visit - Months from March – June and September – October are best for visiting Munsiyari. Seeking for some actions? Head towards Kila Raipur. The annual Kila Raipur Sports Festivals is full of action-packed games and sports which won’t allow you take your eyes off the players even for a second. Though the highlight of the fiesta is bullock cart race but other off-beat events keep the audience engaged equally. This one of the best rural destinations in India offering an authentic feeling of Punjab. Best time to visit - October – March is the best time for visiting Kila Raipur.